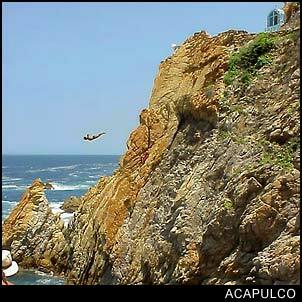 La Quebrada is the name and the place is on the sea side of Hotel Plaza las Glorias (formerly El Mirador). The location is walking distance from the zocalo, but if you are in the hotel zone, you will need to take a taxi. The times are 12:45, 7:30, 8:30, 9:30, and 10:30 . . . but these times are subject to seasonal changes and arriving early is recommended. So, ask at your hotel or any travel agency on the street for current times. The fee is around $4 USD and is collected by the divers. Those wishing to view the dives from the large picture window of the hotels bar will need to pay around $15 USD as a cover charge and reservations are recommended in the high season 744-483-1155. Water Sports : Well, where should we begin in a city littered with things to do in the water. There is no point in a detailed list of service providers that come and go when you can step outside your hotel room and throw a rock at a dozen different places. So, just know that you can expect to find plenty of boogie board rentals, catamaran rentals, scuba diving, boats that take you to Roqueta Island where you can find decent places to snorkel, glass bottom boats, deep sea fishing boats . . . and telling you about each beach would be pointless as Acapulco bay is one huge beach with different names which serve more as location names than anything else. -- If you want to know what is near your hotel, just ask the people at the front desk and they will be happy to recommend someone renting what you want nearby. Fuerte de San Diego : Located near the zocalo, the fort was originally built in 1616 to protect the city from pirate attacks. At the time, Acapulco was making some good money importing goods by sea and was considered a lucrative target for the peg legged, one eyed bandits . . . Now the fort houses the Acapulco Historical Museum and is open from 9:30 AM to 6:30 PM. If you are on foot, just go to the zocalo and ask them to point you in the right direction . . . it's not far. CICI water park : This wet and wild type experience is a favorite of kids and a good excuse for accompanying adults to loosen up and have some fun too. Open from 10 AM to 6 PM general admission is around $11 USD. Located on Costera Miguel Aleman (the main street lining the bay) near the convention center. If you are traveling with young children, bear in mind that they are probably not acclimatized to the heat and humidity . . . they can become dehydrated much faster than you, so make sure they have something to drink at all times. . . and don't forget sunscreen & hats.